Do you still have Halloween candy sitting around? We do. We gave out M&M's this year and had lots leftover. I always buy like we are going to have the number of trick-or-treaters we had a few years ago, but the numbers seem to be down. With all the leftover packages, I thought I would share a simple statistics lesson I use to use when I taught math. You may not know, but the colors of M&M's in a package is actually calculated by Mars, Incorporated. 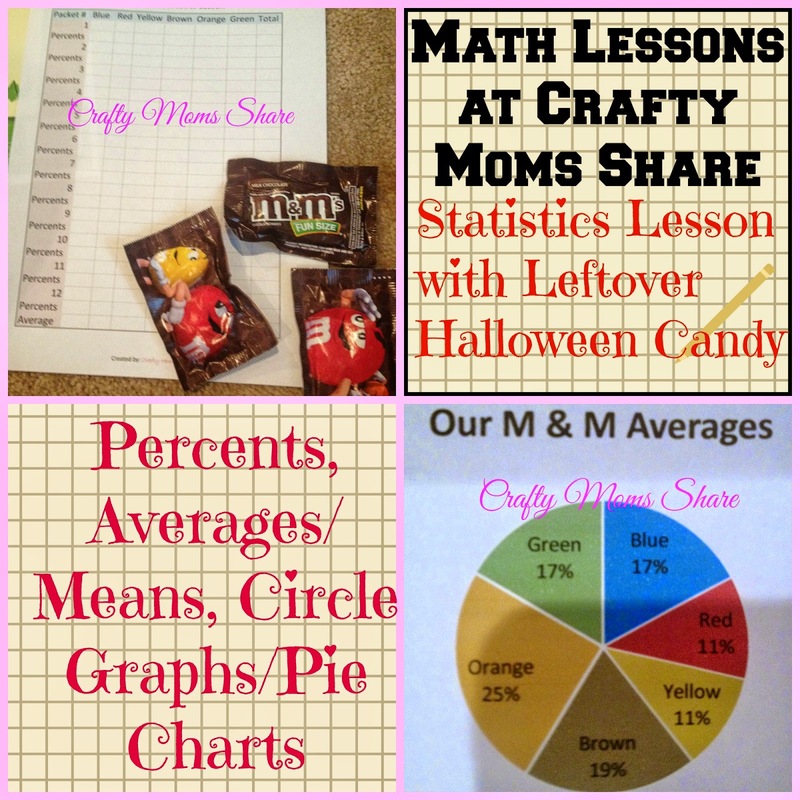 This lesson will involve division/percentages and averaging plus making a circle graph. There are also other extensions you can do with it. We did not do the whole lesson since Hazel is not ready for this kind of math. 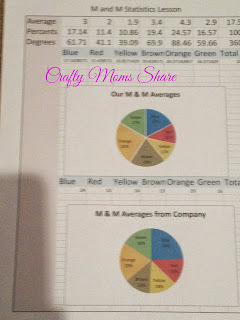 She did however help me gather the data from the M & M packages. 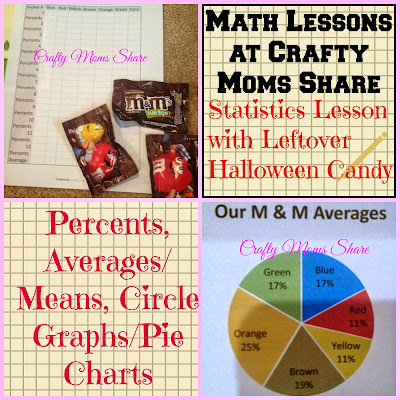 You will need some M & M packages (Skittles will work as well), the printable, a calculator (or lots of scrap paper to do long division) and a pencil. To make the circle graph by hand you will need a compass or circular object to trace and a protractor and ruler. Colored pencils are also a nice touch. 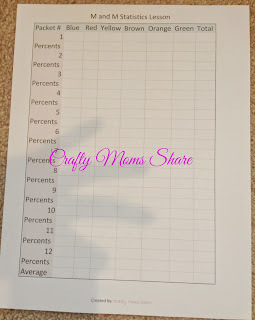 My printable is an easy place to record the data. 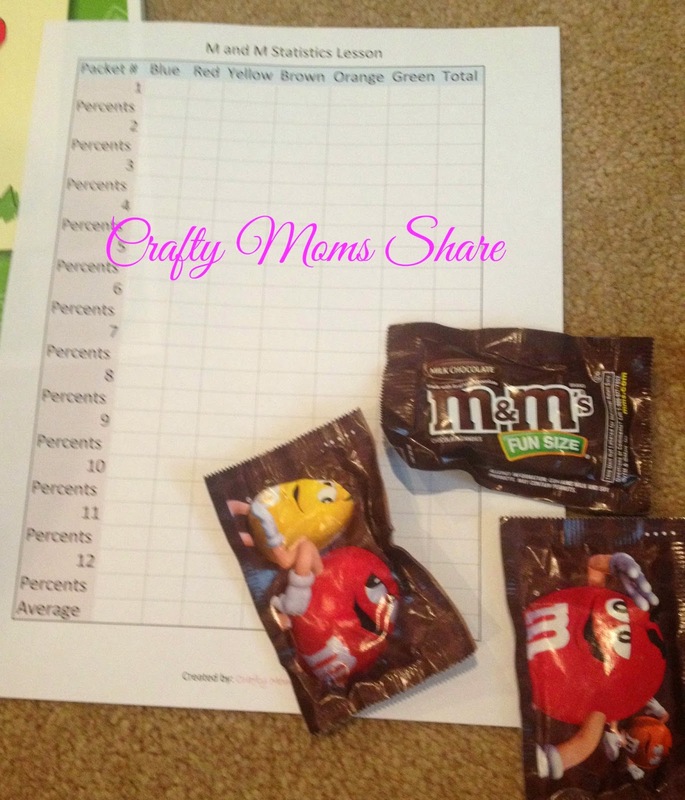 To gather the data each child has a pack of M & M's (all the same sizes and types) and separates them by color. The child records the number of each color and then the total number. After recording the data, I always let them eat the candy. 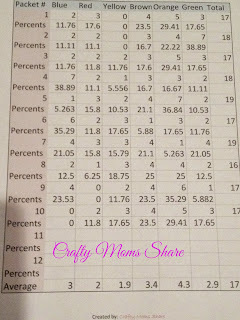 If you have only one child or a small number, have them record several packages each so you have a good amount of data. We had ten packages left so we counted them all and put the M&M's in a bowl to snack on. Next the child needs to calculate the percentage of each color in each package. 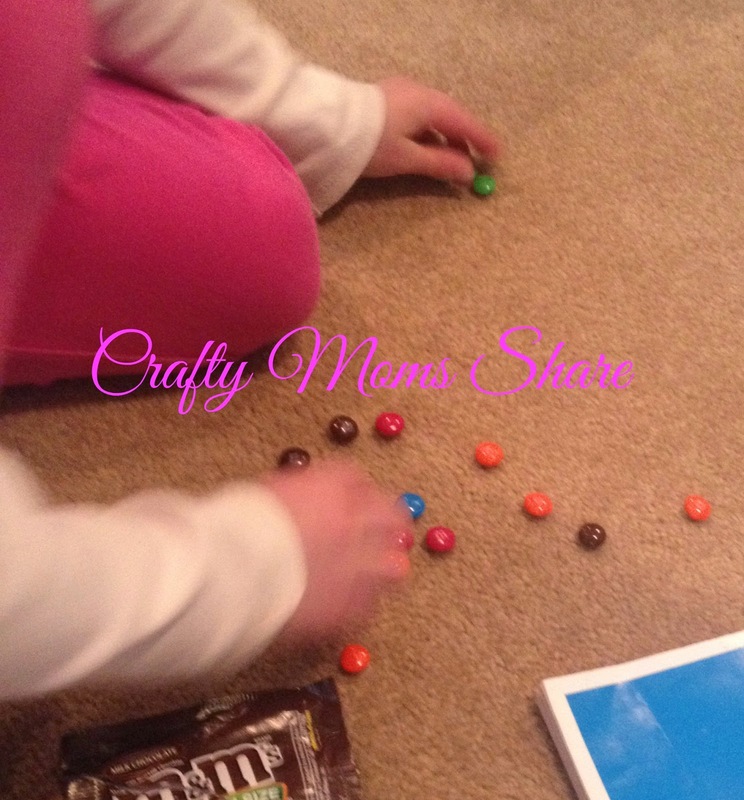 This is easily done by dividing the number of a specific color by the total number of M & M's in the package. 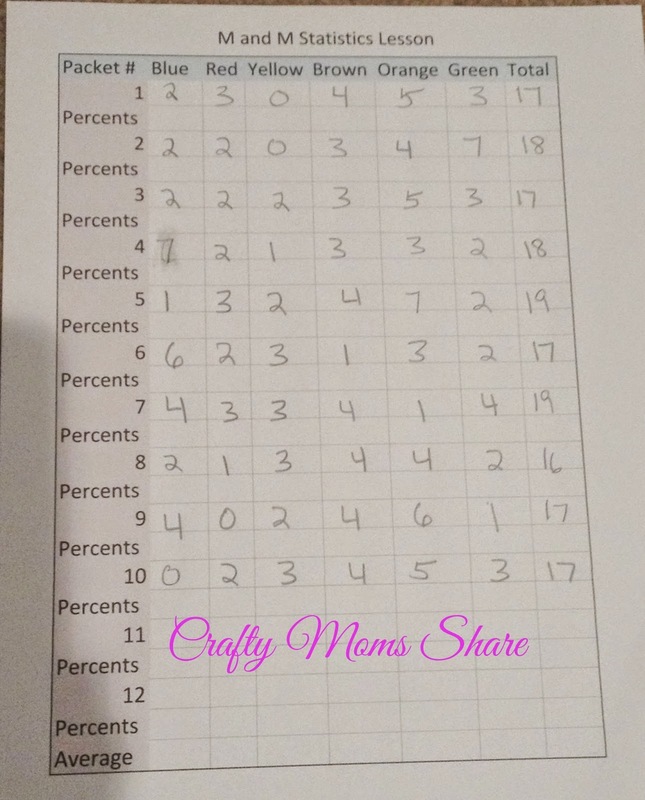 This will give you the percent as a decimal to change it into a whole number multiply by 100 or move the decimal point two places to the left. Since we were not doing this as a math lesson, I put mine into Spreadsheets and calculated it there. Next have the child find the average number or mean of each color based on your data. To find the mean you add up all the numbers of that color and divide by the number of data you have (in our case we would divide by ten since we had ten packages). 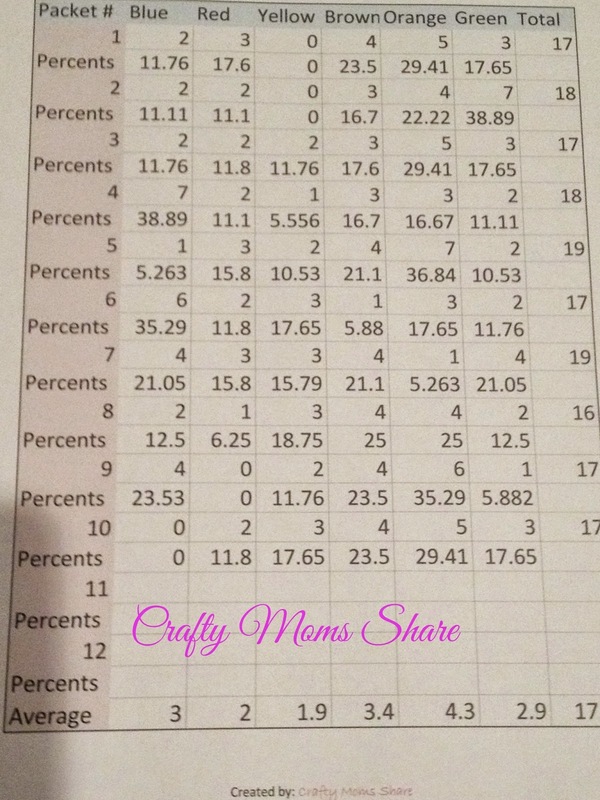 Next I calculated the percents for our averages. At this point you want to make sure your percents add up to 100. If they do not, you will have trouble with the circle graph. To make the circle graph by hand you need to calculate the number of degrees each central angle needs to be. To do this take the percent as a decimal (do not multiply by 100 or if you have move the decimal point back two places to the right) and multiply it by 360--the number of degrees in a circle. Then with draw a circle with the compass (or trace a circle and estimate the center). Draw a radius (a line from the center to the outside of the circle) as your starting piece. Now measure the first piece by putting the protractor on the center of the circle and aligning the line or edge depending on your protractor with the radius you drew. Use your new line to measure the next piece until you are done. I did ours on Spreadsheet since I was not teaching a lesson. 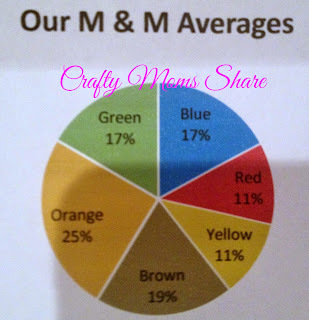 It is always good to add color and label each piece in your pie chart/circle graph. You can get the company's average distribution by emailing the company. I found it on-line or at least the distribution in 2007 at Josh Madison. Now of course it would be good to have the children compare the two graphs and the data they represent. If you have older children you can go further with calculating other statistics like the standard deviation. 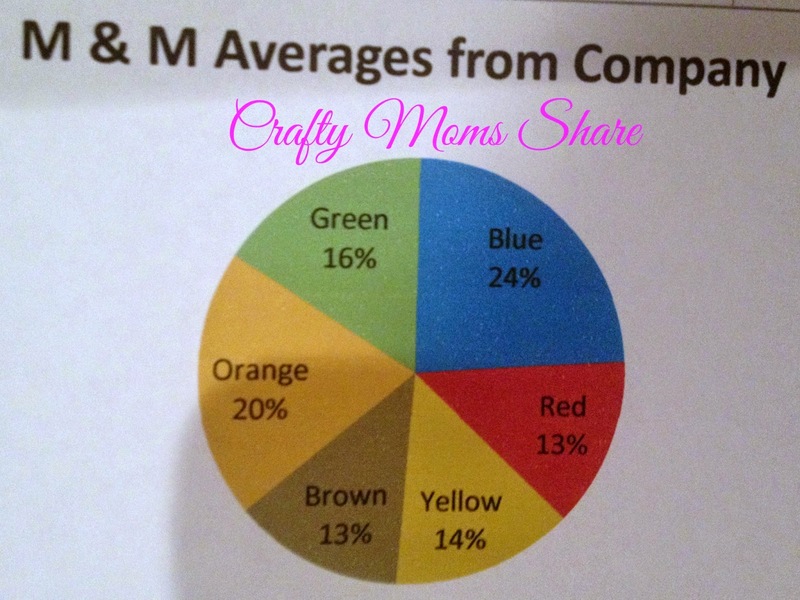 You also could go into probability of picking a specific color from a package once you know the percentages. Finding Shapes and Patterns Everywhere!